For a decade, scientists have puzzled over a surprising phenomenon: Supernovae stars viewed at extreme distances seem to be moving away from us faster than those nearby. Most researchers have assumed that the stars have somehow accelerated – or that, more precisely, the rate of the expansion of the post-Big Bang universe itself has accelerated over time. But hold on just a minute. A group of scientists from the University of the Basque Country in Bilbao, and Spain’s University of Salamanca have offered a different idea. Maybe it’s the passage of time itself that’s slowing down, they say. The distant galaxies only look like they’re accelerating because our deep-space telescopes are essentially looking back in time to see them, to when time was going faster. 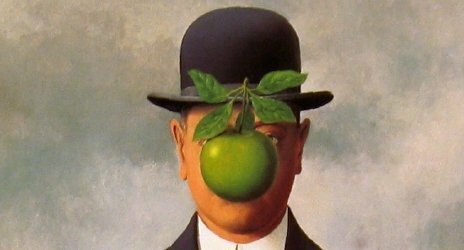 Magritte was born in Lessines, in the province of Hainaut, in 1898, the eldest son of Léopold Magritte, a tailor, and Adeline, a milliner. He began drawing lessons in 1910. In 1912, his mother committed suicide by drowning herself in the River Sambre. Magritte was present when her body was retrieved from the water. The image of his mother floating, her dress obscuring her face, may have influenced a 1927-1928 series of paintings of people with cloth obscuring their faces, including Les Amants, but Magritte disliked this explanation. His art shows a more representational style of surrealism compared to the “automatic” style seen in works by artists like Joan Miró. In addition to fantastic elements, his work is often witty and amusing. He also created a number of surrealist versions of other famous paintings. My painting is visible images which conceal nothing; they evoke mystery and, indeed, when one sees one of my pictures, one asks oneself this simple question, ‘What does that mean?’. It does not mean anything, because mystery means nothing either, it is unknowable. The prospect of a ground-based telescope that can directly see extrasolar planets, the earliest stellar systems and the birth of distant galaxies is nearing reality. The Gordon and Betty Moore Foundation has pledged $200m for the design and construction of the Thirty Metre Telescope (TMT), which is being developed by a consortium of astronomers in the US and Canada, including the California Institute of Technology and the University of California. As its name suggests, the TMT will consist of a mirror 30 m in diameter, giving it eight times the collecting area of any current telescope. But unlike conventional telescopes, the size of the mirror means that it will have to be split up into 492 individual hexagonal segments, all packed together into a curved honeycomb arrangement. As this trip around Sol comes to a close, the annual tradition of creating “best of the year” lists is in full swing. Here, we cover Science magazine’s top scientific breakthroughs of 2007. As one can see at a quick glance, a diverse set of scientific fields are represented, from genetics to neuroscience to computer science. We’ll start out with the breakthrough that earned top honors, then continue onto the nine runners-up, in no particular order. Reprogramming regular skin cells to behave just like embryonic stem cells, publications of Craig Venter’s entire diploid genetic sequence, and turning stem cells into functioning human heart-valve tissue were the top 3 in TIME Magazine’s list of top 10 scientific discoveries of 2007. You are currently browsing the eneve.wordpress blog archives for December, 2007.